So, this machine is a glorified belt sander. Said glorification is however, not unmerited. I’ve been turning for less than a year, I purchased all my turning tools used, none of them had a consistent profile on them… until I purchased the ProEdge. I found myself hunting for other tools to sharpen. Cost: This unit is expensive and if I hadn’t had a gift card to knock a nice chunk of the cost down, I probably wouldn’t have bought it. The cheapest I've seen it is here. They even take off an extra $5 for signing up on the site. Tweaking: Out of the box the standard gouge jig was not square to the belt. It was easy to square it up quick. The tracking was slightly off… also very easy to adjust. The skew and gouge jigs didn’t slide easy but that was fixed by running on the ProEdge and applying a little paste wax. I also re-profiled some old plane and chisel blades I had. For serious use I would still need to hone them on a stone or higher grit sand paper. I’ve run my pocket knife over the 1200 and 3000 Trizact free hand which put a nice edge on it really quick. Cons: Nothing major enough to dock it a star, but here they are. 1. The side guard needs to be rethought. Twisting the two hand nuts is the slowest part of this whole machine. How about a hinge and a quick latch Mr. Sorby? My guard mostly stays off. 2. The motor on the left can sometimes get in the way a tad with larger handled tools that have a low angled grind, minor annoyance. Pros: 1. Belt width is a nice 2 inches wide. Way better than my old grinding wheel. 2. Quick belt changes with side guard off. 3. Quick setting of angles and jigs. 4. Cutting edge of my tools has never been better. 6. On-board instructions: see 2nd photo at top. 7. Don’t have to think hard about sharpening and spend more time turning. 8. Adjusting the angle of the belt makes working at any angle convenient. Would I recommend it? Yes… buy cheaper chisels and get this sharpener. Using it is a pleasure. Great review. I think this would be a great and viable alternative to the old Wilton square wheel grinder I bought back when I was making some knives years ago. At $500 it’s much more realistic than the Wilton (which has apparently been bought by Jet and the same tool is now $2800). These belt machines are much more controllable than a regular stone wheel grinder and once you’ve used them, it’s hard not to like ‘em. I’m not sure if I’ve seen the jet/wilton sharpener. Is it the one that is like Tormek? I considered Tormek but he price ($500-$800 with jigs) is way up there. I also liked the idea of the flat grind/cut instead of the slight concave cut you get with a wheel. The work sharp 3000 seems like a good machine, but kind of cumbersome when watching someone trying to profile fingernail gouges. Here’s a picture of the Jet machine. New color, but identical to the old Wilton. I see that a variable speed model is now available, but price goes up to $4000. It’s really more of a knife making grinder (optional size wheels, etc) than just a sharpening tool, but sharpens fine. Uses a 2” x 42” belt. Originally designed for industrial de burring operations etc. I think. Been around for many years. My main point is just that I think your machine is by far the better buy these days. Your view is very much appreciated. It looks like a real nice practical piece of equipment. I purchased this machine about four months ago.At $500 that might seem a little pricey but it is a bargin once you use it.The tools are always sharpened at the same porfile and scarry sharp.You can also use it free hand for the special tools. Roger- Oh wow… $4000! I agree, ProEdge wins. FYI- The ProEdge belts are 2×41’’ I think. Good review and Sorby has a nice video too but at $530 it’s outside my woodworking budget. +1 on what Rick M. said! Could one flatten a chisel back with it? Flatten a chisel back? You’d have to take off the accessories. It could certainly do it. Youd just have to make sure the support behind the belt is perfectly flat. Maybe I’ll try it with one of my unflattened chisels and get back to you. Has your opinion changed after 3 months? I’ve been eyeballing this for a while, it looks very promising. I wonder if they nickel and dime you to death buying accessories to make it useful, or is it fairly complete? From what I have seen, it is ready for woodturning right out of the box, but jigs for hand tools, knives and plane irons need to purchased separately.I may be wrong about this.Have you had to buy any add ons? As far as cost, it appears to be a bargain when you consider a grinder, wolverine jig and CBN wheels will cost more, and can only do woodturning tools. This is advertised as able to sharpen almost anything. I’ve watched the videos, have not seen one in person. I have some of their turning tools. They make high quality tools. I like hearing what folks have to say when they are NOT trying to sell it to me. Hairy – I’ve really enjoyed having it. I find it is pretty complete. I bought the deluxe (PED01) so it came with the fingernail jig and 3 belts and everything I needed to sharpen bench chisels, planes, and all my turning tools. You can buy a square guide but just use the edge of the bowl gouge jig (long V looking thing) to square my chisel to the abrasive. 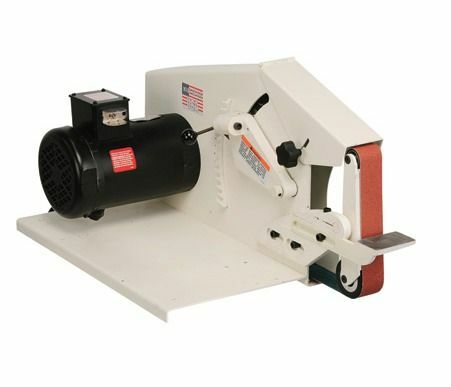 1 – sold my bench grinder. 2 – buying the 3 trizact belts like I mentioed above which are wonderful for bench chisels and planes. I also use them on the turning tools still. I don’t find that I need to hone the plane blades past 3,000 grit I get with the trizact belt. 3- created a little rack (picture a block of wood, a square dowel sticking up out of it with another square dowel crossing it at the top like a T). Then I have little pegs in the T Rack to hang my belts on. In the wooden blocks I have a dado and some holes to hold the fingernail profiler and the other accessories and tools. 4 – Created my own version of the “proset” http://www.robert-sorby.co.uk/proset.htm out of ply wood. In their older videos they say that a 2 inch over hang on the fingernail profile give you a 45 degree angle so I just added or subtracted 1/2 inch or so and set my stops. I am still excited to find a dull tool in the house. I’ve thought about making the Long Grind Jib out of a dowel. But haven’t needed a long grind yet. Thanks! Where did you buy it? The link you put in is dead. Woodcraft and Craft Supplies have it, but they put their own part # on it, so I’m not sure which version you get. Sorby’s webpage sells different versions. I’ve also read about the US versions have a different tool rest than the UK type. UL got involved. It looks to me like they are all selling the same thing, just the price is different. That proset gauge is what I’m talking about. $22 seems kinda steep for that. If I get one, it won’t be soon. This is real tempting. Thanks!!! 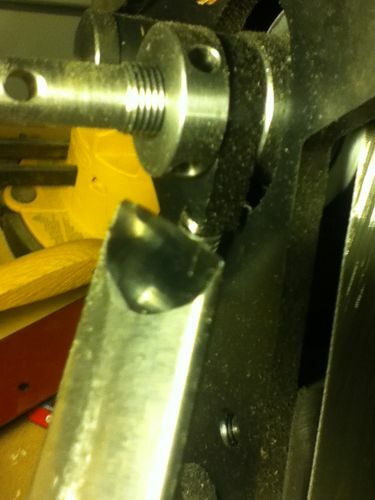 Yeah… $22 for a small piece of sheet metal… that’s why I made my own. Got mine at http://www.chefwarekits.com I looked it up and the price has gone up significantly. thebestthings has the best price.